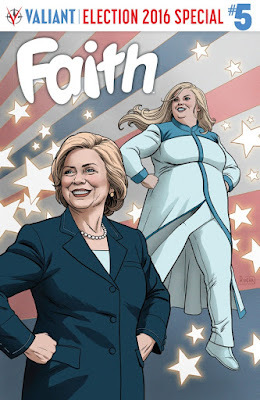 NEGROMANCER 2.0: Valiant's "Faith" Joins Hillary Clinton on November 2nd in the Comic Book, "Faith"
Valiant's "Faith" Joins Hillary Clinton on November 2nd in the Comic Book, "Faith"
NEW YORK--(BUSINESS WIRE)--In advance of San Diego Comic-Con International 2016, Valiant Entertainment is proud to announce that Hillary Clinton, the Democratic Party's presumptive nominee for President of the United States, will join forces with Faith "Zephyr" Herbert on November 2nd, 2016 in FAITH #5 – a history-making, 48-page election special teaming the leading female hero in comics today with the first female nominee from a major political party for a special tale written by comics legend Louise Simonson with art by FAITH's own Pere Perez. Plus, also coming in the oversized, 48-page FAITH #5 election special: Faith's adventures continue with an all-new lead story by the ongoing creative team of writer Jody Houser (Orphan Black) and new series artist Meghan Hetrick (Red Thorn), as well an exclusive prelude to HARBINGER RENEGADES #1 – featuring the long-awaited return of Faith's beloved superteam – by writer Rafer Roberts (A&A: THE ADVENTURES OF ARCHER & ARMSTRONG) and Eisner Award-winning artist Colleen Doran (The Sandman)! With covers by Eisner Award-winning superstar Paolo Rivera (THE VALIANT, Daredevil), Harvey Award nominee Clayton Henry (SAVAGE), new ongoing FAITH interior artist Meghan Hetrick (Uncanny Avengers), and more, join an all-star cast of Valiant's greatest talents on November 2nd in FAITH #5 as the leading heroine in comics today joins forces with Hillary Clinton for a landmark comics event! Valiant Entertainment is a leading character-based entertainment company that owns and controls the largest independent superhero universe in comics. With more than 81 million issues sold and a library of over 2,000 characters, including X-O Manowar, Bloodshot, Harbinger, Shadowman, Archer & Armstrong, and many more, Valiant is one of the most successful publishers in the history of the comic book medium. Today, the company’s characters continue to be forged in publishing, licensing, film, video games, and beyond. Valiant consistently produces some of the most critically acclaimed comics in the industry and has received numerous industry awards and accolades, including a Diamond Gem Award for Comic Book Publisher of the Year. In 2015, Valiant announced a multi-picture deal to bring Bloodshot and Harbinger to the big screen as feature films.